Engage your students in this moral inventory project. 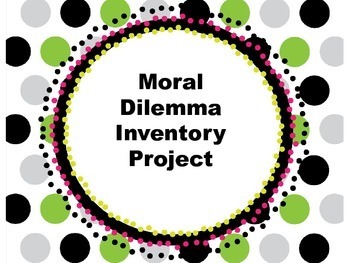 Throughout this project, students are asked to conduct a short survey revolving around the overarching question: Is the happiness of the majority, worth sacrificing the happiness of the minority? Students will then analyze their finding and reflect on the implications of their data. This Omega English product contains project instructions, as well as a 2 page graphic organizer for students to record their findings. Please don’t forget to follow my store, Omega English , for more great lessons, bundles, and free monthly downloads!